Already a long time winemaking exists at Crimea and is “mother” of all winemaking in the world. By nature all the conditions have been created for viticulture high quality grapes and all types of wine. About 3000 years ago the people living at Crimea started to cultivate winemaking. In the 6th century BC Greek colonists appeared at Crimea, founded Chersoneses and viticulture was the main branch for them. Chersonesuse’s winemakers produced about 90-95 thousand liters of wine. They used about one third of this wine their selves and exported the rest. Archeologists found a monument of the 6th century BC which said “Agasicle was honored by the nation with this monument for planting the grapes”. It was the first monument to the Crimean winemakers. Their winepresses are still preserved somewhere in cave towns and monasteries of Crimea. This extremely special Wine Tour of Crimea takes place in one of Europe’s most picturesque and healthy regions. Crimea is a unique monument of nature, one of the few ecologically pure places of the world. The peninsula has always been famed for Mediterranean salubrious climate by mountain woods and the Black Sea. In the exotic nooks of Crimea you will come across disappearing and relic plants. Crimea is a treasury full of ancient legends you will know and ancient songs you will hear. Besides you will have a chance to try national dishes and of oriental cuisine. The sunny Crimean peninsula is famous for its vintage wines which you will be able to try in wineries or in wine-tasting halls. Taste this delicious wines at cellars, dine at the top gourmet restaurants and visit some of Crimea’s most charming medieval and coastal villages. Your wine tour begins when your charming private guide meets you at the Simferopol international airport and first you will head south to the Sudak wine countryside. Over the next few days, you will visit top estates like Massandra, Inkerman, Koktebel and Novy Svet, the medieval village and Genoese Fortress at Sudak and the stunning Panorama of Sevastopol. You will visit the plant of sparkling wines "New World" in Novy Svet, awarded with the Grand Prix at the Paris Contest in 1900 and you will see Gallitzin’s caves and cellars and his estate as well. Following your stay in Sudak you travel west towards Sevastopol. Your base for this part of the tour is Sevastopol. You will visit Balaklava, a delightful town located at the harbor between the a hills of the south coast, surrounded by vineyards and medieval towers. After a few fascinating winery visits to leading winery estates like Inkerman and Balaklava over the next few days, you'll continue and visit Massandra and the wine cellars of the scientific research Institute of wine making and grape growing "Magarach", where the unique storehouse of wines is situated and where wines have been stored since 1775. You will be able to appreciate a great variety of wines recognized internationally and awarded two Grand Prix Cups, gold medals at the international Wine Contests (including the famous White Muscat of the Red Stone and unique sherries). You’ll visit the prestigious Chersonesus ruins, a lovely historic village founded by the Greeks, and later used as a royal residence for Prince Vladimir of Russia. Visit the beautifully restored Livadia Palace with gorgeous rooms and the Tsar’s furniture. At Yalta there is an absolutely stunning fairytale castle named “The Swallows nest” build at the rock just a few meters above the Black Sea that you will be able to visit. Conclude your wine tour of Crimea with a few days extra and relax in the sun at one of the many terraces at the embankment in Sevastopol. If you are a food and wine lover and prefer small, charming villages then you will enjoy this gourmet wine tour immensely. Crimea is relaxing, and you will appreciate having your own personal guide and driver so you can enjoy the wine tasting completely! Contact us for more information on this unforgettable wine and culinary vacation at the subtropical peninsula Crimea at the Black Sea Riviera. century BC people. This day you will arrive to the Simferopol international airport where your driver and guide will be waiting for you. Travel south-east by comfortable car, minivan or bus to the historic ancient town of Sudak what was founded in 212 AD. It became an important location for trading on the Silk Road in the 12th and 13th centuries. In 1804, the first Russian school of viticulture was opened there. Welcome to Crimea! With your guide you will enter the old fortress built in the 6th century and spend the morning exploring the area and enjoying the fabulous views. A wonderful traditional Crimean lunch will be organized in an atmospheric restaurant. After lunch, you continue on to the small village of Novy Svet. On a quiet coastal country road with beautiful views over the Black Sea for about 30 minutes of the medieval town of Sudak you may find the Golitsyn Champagne Museum. The Museum and Tasting hall of sparkling wine (a la Champagne) plant 'Novy Svet' (founded by L.S. Golitsyn), in the house, where Golitsyn (Golitsin) lived. Established by Prince L Golitzin in 1878. He acquired the area known as Novy Svet on the southern coast of Crimea, on the same latitude as southern France and so the climate was perfect for growing the highest quality organic grapes. After building 3 km of cellars and planting the Chardonnay, Riesling, Pinot Meunier and Pinot Noir grapes, he spent ten years refining his creation with the traditional method of bottle fermenting for three years, at a constant temperature of 15C. In 1896, his sparkling wines (Krim Sect) were served at the coronation of the last Tsar, Nicholas. That same year, Prince Golitsyn used the right to display the family coat of arms on his wines. His creation finally became famous to the world when it won a Grand Prix at the World Exhibition in Paris in 1900. Novy Svet sparkling wines are made by the traditional method, hand rissled by one person and bottle fermented for three years. Each coupage is produced solely from each particular year’s harvest. You will be offered the degustation of 3 sparkling wines. At your leisure, your guide will take you on to your hotel. The evening is yours after diner in a beautiful Tatar restaurant where you will be served the finest dishes from the local cuisine at the traditional way. Today you will spend the day discovering the cognacs of Koktebel. The little town is situated on the shore of the Black Sea, about halfway between Feodosia and Sudak and is subordinated to the Theodosia city municipality. It is best known for its literary associations. The Russian poet Maximilian Voloshin made it his residence, where he entertained many distinguished guests, including Marina Tsvetayeva and Andrey Bely (who died there). They all wrote remarkable poems in Koktebel. It became also famous for its cognac during the former USSR. You will visit the leading estate and visit one of the region’s most famous cognac shops. Learn all about how the Koktebel cognac is made. Begin with a short drive to the cellar. You’ll have a private tour of the vineyards, see their historic place and finish with a tour and tasting of three of their flagship cognacs. After this day of wine tasting and walking in the vineyards, you will travel to the direction of Sevastopol. But before arrival you will be well ready for some diner. We have a special diner organized for you at a restaurant along the road, a convivial little eatery. This restaurant is revered for its sea dishes and roast lamb. After diner, you drive up to your hotel in Sevastopol to have for the rest of the evening at leisure. This morning, head in the heroic city of Sevastopol to the place where the first settlement was. The Ancient Chersonesus. Chersonesus was founded by ancient Greek colonists in 6th century on the territory of modern Sevastopol. It was called – Chersonesus the Taurics. In ancient Greek the word “Chersonesus” meant “Peninsula” and the word “Tauric” came from the name of the Tauric tribes lived in the Crimea. Nowadays “Tauric Chersonesus” is a national reserve and listed on Unesco world heritage. In the 3rd century BC the city-state was risen at its peak. Greeks have built buildings, a fortress, mint and theatre. They were also specialized on winemaking and viticulture. They made wine of high quality and exported it to Athens, Alexandria and cities around the Black Sea. Chersonesus successfully waged wars against Scythians and Taurics. Since the 1st century BC the Roman navy and legion constantly stayed here. One of the key events in the history of the East Slavonic nations – the Christening of Kievan Rus Prince Vladimir in 988 was also connected with Chersonesus. The light of Christianity that he brought to Kievan Rus was lit in Chersonesus. You´ll have a private tour at the facilities and conclude with a tasting in a wine shop. Taste their main wines. Ending the morning with a visit of the beautiful and breathtaking Panorama "Defense of Sevastopol 1854 - 55" at the Historic Boulevard in Sevastopol. After lunch you will head to the north wine region of Sevastopol where the Inkerman Winery was founded in 1961 in the cave galleries of Sevastopol area, in a small town named Inkerman. In the limestone galleries witch were rebuild in the 1940-s after WO II in the ruined Sevastopol. During the next 15 years a whole city grew up under the ground. Kilometers of galleries, 12 meters height and 10-12 meters wide are run to depth of 5 to 30 meters. Here you will hear the history of the Crimean winemaking, the history of the winery, visit wine cellars, get knowledge about the technology peculiarities in making dry fine wines and fortified and dessert fine wines, and have the possibility of tasting 8 samples of wine. (dry, fortified and dessert wines). When the tasting is finished, your guide will take you to the northern part of Sevastopol thru the vineyards to ferry to cross the bay and harbor from where you have a view at the fortress of Sevastopol and the city centre. After diner in your hotel in Sevastopol, you have the rest of the evening at leisure. From Sevastopol, today you will travel to Yalta. This wealthy, mainly touristic region along the South Beach, is pristine and largely unspoiled. You will visit the Massandra Palace and the winery. The winery at Massandra has existed since the mid 19th Century. The cellars were built in 1894, as seven 150-metre tunnels bored deep into the mountainside. The temperature is perfect 13-14 Centigrade, ensuring the wines are stored in perfect condition. The Massandra Collection was originally built by Prince Lev Sergeivich Golitzin, who was a collector of Massandra wines and the best wines around the world. The collection was augmented in 1922 when Stalin ordered all wines found in the Tsar's palaces to be moved to the cellars. Some wines bear the Tsar's seal. Wine is still made by the Massandra Collective, established under the Soviets, where a number of member estates employ 5,000 people and farm 4,400 acres of vines. The best of Massandra is fortified wine in a style similar to Port and dessert wine made from Muscat, Tokay and Pinot Gris. The Massandra Collection is a treasure trove of ancient wines. The Massandra library retains a minimum of one bottle of every wine, but limited numbers of these historic wines are released for sale. The list is fascinating, from a single bottle of 1865 Yquem bottled for the Tsar at a cool £7,000, to a 1948 Massandra Tokay for £165, and rated at 96 points by Robert Parker. Younger wines from the 1980-s are available from as little as £20 per bottle. Visit the old cellar, and finish with a tasting of 6 of their flagship wines. This evening you will transfer back to Sevastopol and enjoy dinner in a restaurant with a breathtaking view where you try one of their meat dishes. This morning you will begin with the Diorama what is one of Sevastopol’s most important monuments about WO II and a peek at the beautiful village of Balaklava and her secret submarine harbor. Have a look at the vineyards and bring the camera as there is a great view of Balaklava battlefield and vineyards. It was in Balaclava that Florence Nightingale helped set up the first professional military hospital. And the nearby Balaklava Valley was the site of the infamous "Charge of the Light Brigade" where the British had a disastrous loss during the Battle of Balaclava in October 1854. Carry on to Balaklava, situated at the South Coast for a private wine tour. This is one of the most beautiful wineries in the region and the backdrop of the Aj Petry mountains is captivating. 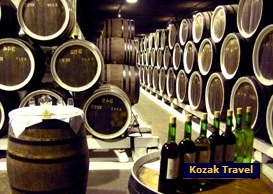 The Balaklava wine-making plant named "Zolotaya Balka" and Inkerman vintage wine winery are world-known. The winery cellars more than 3 million bottles of wine! The rest of the afternoon and evening is yours, with your guide available if you’d like to go sightseeing to one of the optional places. You may choose to stay in Balaklava or use the transfer to the centre of Sevastopol. You will visit the Livadia Palace what was the summer residence of the last Tsar and the place of the “Yalta conference where Churchill, Roosevelt and Stalin met at the end of WO II where you will be served your lunch in the restaurant “Czar’s Cuisine”. 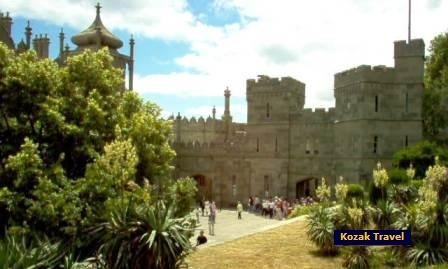 You also will visit one of the most famous wineries at Crimea in the world "Magarach". The word means "source" or "spring" and refers to the Institute, which is the principal research center of the industry and the birthplace of the national science of vine and wine, where the mystery of wine has been investigated for almost two centuries. Witnesses to that are the vaults of the Institute's cellars and its old, but still living, wines. In 1990, the Institute "Magarach" hosted the 70th General Assembly of the International Vine and Wine Organization. Grape and wine growers from all over the world came to Magarach to participate in that international event. In 1995, the Association of the Enologists of the Crimea was established on the initiative of the Institute "Magarach". The Association unites both researchers and practical wine-makers. It holds courses of wine tasters and wine competitions, which helps to improve quality of wines not only throughout the Crimea. Such competitions welcome enologists from all over the world and encourage both human contacts and professional exchange of skills and traditions for the benefit of the art of grape and wine growing. During your visit you will have impressions of the Institute's. There is nothing strange about it since wines of "Magarach" work miracles. In their tasting room you may taste them, and your heart will again be awake to inspiration, and life, and love. Back in Sevastopol we visit a restaurant in local Ukrainian atmosphere where you will be served your good bye dinner to end this fabulous wine tasting tour on the Black Sea Riviera at the subtropical Crimean Peninsula. This morning at your preferred time (depending on your flight) your driver will take you to the airport and this concludes your food and wine tour of Crimea. We hope you had an amazing time and we look forward to see you on another tour again! Of course it is possible to stay more days at Crimea. We like to help you to accomplice this. All tours between May 10 and October 27, 2017are fully booked. Single room supplement: €365 extra p/p. We organize excursion packages and tours from 1 day, to weekends and longer. Food and wine discoveries throughout the Crimean peninsula.